In Southeast Asia there is still a fairly constant fear of germs. The dense population, where you're very likely to come in fairly close contact with someone who is sick while on public transportation makes it easy for illnesses to spread. SARS caused a lot of fear in Hong Kong, where to this day it's still common for people to walk around wearing masks to avoid spreading germs. In fact, you're likely to draw hateful glances if you cough, or sneeze without wearing a mask while riding the MTR. Appropriately, the film begins in Hong Kong where a boat transports a crate full of illegal Filipino immigrants headed for South Korea, and one man coughs without the cover of a mask. That's all it takes. Upon arrival in Bundang the crate is opened to reveal everyone has died, except one person, although he does seem to be showing the symptoms (a fact that is never cleared up). 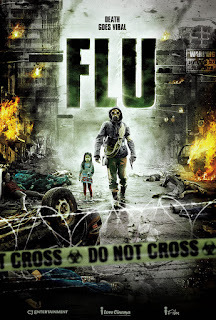 While he flees the situation, one of the two men who had opened the crate contracts the virus and checks in at the hospital where it's discovered that he has a mutated version of the H5N1 virus. There's also a humorous rescue scene early on in the film. Kang Ji-goo (Hyuk Jang), a rescue worker, saves Dr. Kim In-hae (Soo Ae), a single mother, from a wreck that leaves her car hanging precariously. It's a humorously awkward meet cute, and one of the few scenes aspiring to break the tension with humor. Ji-goo has an instant crush on her, and for the rest of the film goes out of his way to help her and her daughter. It's understandable once we meet In-hae's adorable 6 year old daughter Mi-reu (Park Min-ha), who meets Ji-goo, when he returns her mother's bag that he recovered from the crashed car. As the virus spreads, we're given interesting shots that give us a sense of how easily germs can spread. And as they do, more and more people come into hospitals seeking treatment. The more the virus spreads, the more panic ensues. Cars crash all over the city as sick drivers lose control. It prompts the government to lock down the city to keep the epidemic from spreading, despite knowing that about half the population is likely to die from the virus. The immediate question this brings up is, why couldn't they get an antidote from those immune? Instead they intend track down the Filipino immigrant Mong Sai and use his blood for the antidote. The quarantine separates those sick from those immune. The sick are taken away placed in secret rooms where no one knows what becomes of them. The hope is they're being treated, but wild rumors spread as to what goes on, however the truth is even stranger than the rumors. It illustrates the theme of the fear of the government, particularly in dire situations. In fact, the government's handling of the situation is constantly under scrutiny. There's a familiarity in the script with previous epidemics, despite the fact that what goes on here is unlike anything we've seen before. They mention the fear of how citizens inside the quarantine zone will portray the situation on social media, and they acknowledge that the world is watching them, waiting to see how they'll handle it. If they allow the virus to spread beyond Bundang the entire world is at risk. What becomes essential is the character of Mi-reu, who even at the age of 6 gives a great performance. Working with child actors isn't easy, but she nails the part, and shows a maturity beyond her years. At the center of all the madness is the drama of a mother trying to reconnect with her daughter, and how far Ji-goo will go protect both of them. The relationship between the three of them is what ties the film together. It goes to some fairly dark places, stays very tense throughout, but keeps these three characters at the forefront of the action. 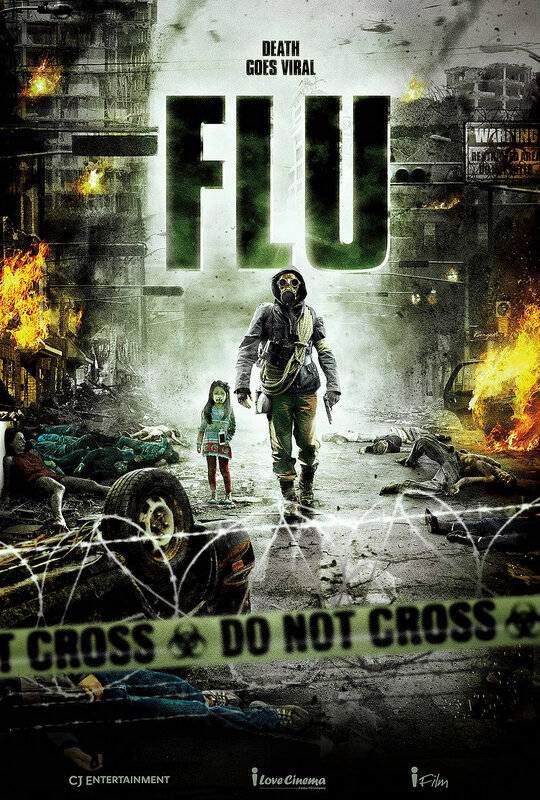 There's a good movie somewhere in "Flu." The first half of the film is rather good, and the central character's desperate journey is a tense, thrilling ride. However the second half ratchets things up to an absurd level. About halfway through, the film takes a turn, and more and more of the film's logic begins to stretch. There's also an entirely unnecessary fight for power between the South Korean President and the South Korean and American Defense Ministers, who cite the Mutual Defense Treaty between the United States and South Korea as justification for striping the President of his power, and drawing weapons on anyone attempting to flee the city. It's a strange villanization of westerners that creeps up in the last 45 minutes of the runtime. It's also hard to believe some of the poor treatment of those infected. Despite some inconsistent logic (even some of it downright poor logic) in the film, it is an entertaining blockbuster from a country whose films are gaining more and more attention here in the states. The performances from the leads are all strong, and the little girl, Park Min-ha, will have you desperately rooting for them. One way or another, this film will have you thinking twice the next time you hear someone coughing.